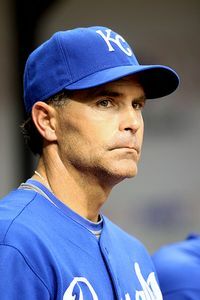 Trey Hillman became the first manager to get fired this season when the Kansas City Royals let him go Thursday after a final win. Former Milwaukee Brewers manager Ned Yost, who had joined the Royals’ front office in January, immediately took over the team. The Royals announced the move after beating the Cleveland Indians 6-4, a win that left Kansas City at 12-23 and last in the AL Central. The 47-year-old Hillman was in his third season with the Royals and went 152-207. Kansas City was 75-87 in 2008 but then dropped into a last-place tie in 2009 at 65-97. Yost managed the Brewers from 2003-08, when he was fired late in the season with the team in the playoff race. The Royals hired him last winter as a special adviser for baseball operations. Hillman spent a 12 years working in the New York Yankees’ system and won a couple manager of the year awards in the minors. He then went to Japan for five years and was considered a major league manager-in-waiting. The Royals have been dreadful since the mid-90′s. A team that once made it against all odds, now accumulating a record almost as pathetic as their predecessors(The Athletics) in KC. If not for Zach Greinke, the Royals would be certain to lose 100 games this year. They still may do it, and a change of manager isn’t about to alter the franchise’s fortunes.